The desk features three large drawers and a tray with signature beveled wood fronts and accentuating brushed brass hardware. The hutch offers plenty of storage and display opportunities. With three top sections and four stationary shelves, your children will be encouraged to keep their books, papers, and albums in perfect order. The hutch features a simply, durable and relaxed design and restrained elegance. 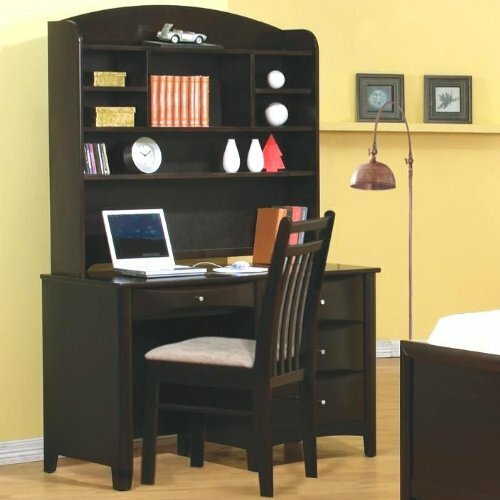 Dimensions:Desk: 49.00"L x 23.00"W x 30.75"H, Hutch: 45.50"L x 9.00"W x 42.50"H, Chair: 20.00"L x 16.50"W x 36.00"H. Some assembly may be required. Please see product details.